I’ve spent quite a bit of time sewing up muslin lately. First I dug out a dress pattern I drafted back in 2011 when we lived in Wyoming. It fit perfectly. Back then. Last week I could zip up the dress but didn’t have the courage to sit down, hehe. So I mocked it up in muslin, with wide seam allowances for the side seams, to see how much it needed to be adjusted. Not much, as it turned out – adding ½” at each side seam gave me enough room to sit down comfortably. Well, comfortably… for a woven. Now that I’ve been living in knits for years, I have apparently developed a new definition of comfortable. That new definition includes a stretchy hem. I don’t know how I’m going to get that in a woven dress. I was all set to cut some fabric for that dress when I thought hmm, what if I could make a dress without a zipper? 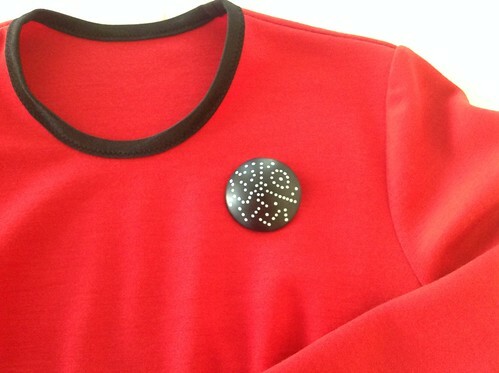 Back to the drawing board – this time using my SFD Shirt Kit blueprint as in the black dress I made last year. I drew in a jewel neckline and copied the side seam shape from hip to hem from the adjusted 2011 draft. It fits quite nicely once belted, and I now have a couple of narrow elastic belts thanks to Ruthie’s comment about them on Stitcher’s Guild. I like the stretchy belts much more than the regular unforgiving leather kind. So now I’m ready to cut the wool suiting. It’s been washed and dried, needs to be ironed. I’ll iron it today. Next up was supposed to be a jacket to match the dress but I’m finding myself dreaming about all kinds of other jackets. Something in red, maybe. Or maybe not. It’s just that I’ve been sewing black and dark gray (muslin doesn’t count) these last few weeks and I’m ready for a break. Even with polymer, I’ve been working mainly with gray. Well, silver. But that’s really a shade of gray. 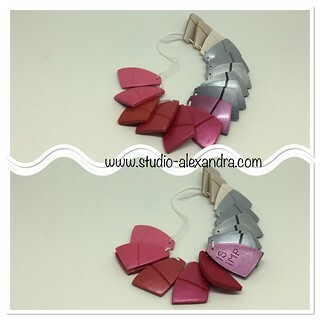 Like these mica shift beads. 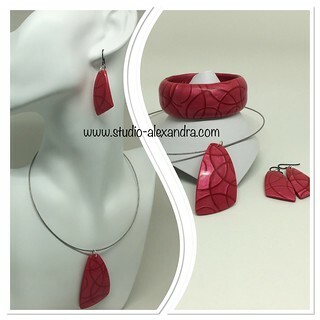 They’re the right size for earrings and a pendant necklace. They might even get finished soon. Happy New Year and may it be filled with beautiful fabrics, soft yarns that never tangle, and pliable polymer clay! Last year, taking on a full-time job meant limited creative time/energy. With a part-time schedule, this year should be more relaxed and I have several goals/intentions for it. 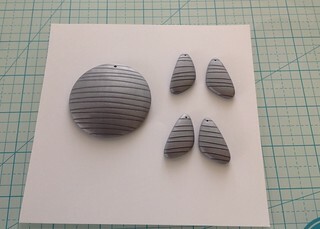 I plan to average at least an hour a day in the studio – so on my days off I will spend at least an hour sewing and at least an hour working with polymer. I’d like to sew up at least 50 yds of fabric this year. New purchases count in this so it won’t be all existing stash. I need dresses and jackets and a lot more red in my wardrobe. I also have a pretty decent SWAP plan, not quite finished but getting there. So I intend to fill those holes and follow the plan, and make coordinating jewelry to go with the new pieces, and share it all here with you. I have some fabrics that I really like but am reluctant to cut. I’m not sure why. 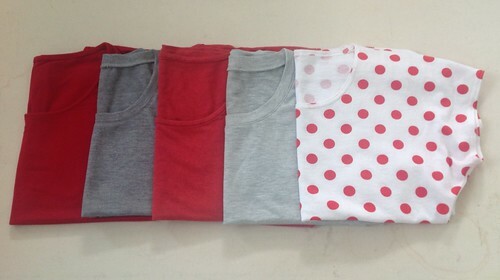 But the point is, I’m going to make an effort to push through the block and sew up at least a few of them. I have decided that my creative year starts Dec 26 and runs through next Christmas Day. 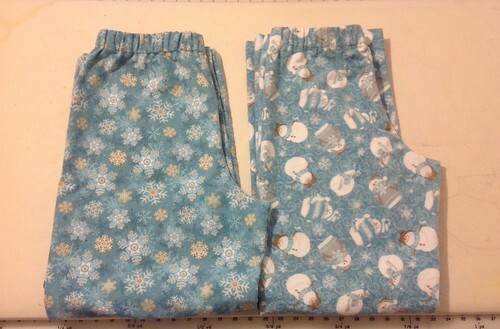 I have made a good first step in the 50yd challenge already with these two pairs of PJs (lounge pants, really) in two different cotton flannels from the same collection. Snowflakes are for DH, snowmen are mine. We’re wearing them right now, in happily coordinated bliss. 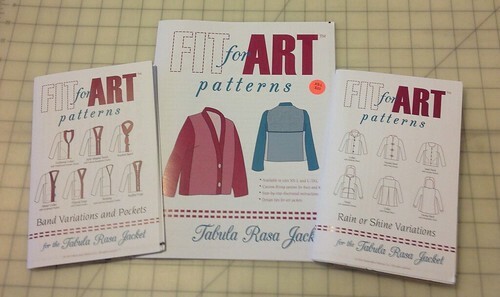 Right after posting my preliminary SWAP plan last time, I discovered the Tabula Rasa Jacket by Fit for Art Patterns. It had been on my radar since earlier this year but only when I came across some neckline variations did I start seeing this pattern as something I could actually wear. I immediately ordered the main pattern, the Rain or Shine variations, and the Band and Pockets variations directly from the company. The package arrived in two days and I got to work on fitting it. Following the fitting instructions in the pattern, I used size Small, with the AB front. Knowing that I prefer a jewel neckline, I used the jewel neck template from the Rain or Shine variations right off the bat. 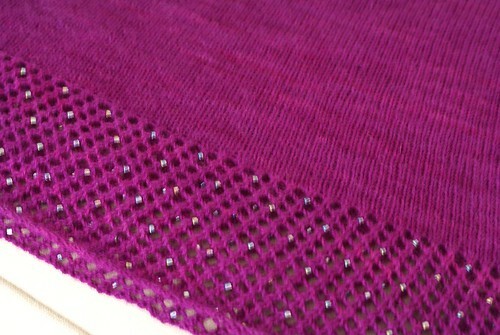 On comparison with a well-fitting top, I adjusted the shoulder slope first. The front was fine out of the envelope, the back needed a ¾” low neck base alteration – this corrects the shoulder slope and starts shortening the back (mine is very short and erect). Then I cut the muslin and sewed it using the included ⅝” seam allowances and 1½” hem allowances. cut off ½” from FRONT hem only to correct the original patternwork (on walking out the pattern, the front is ½” longer below the notch and there is no reason to ease this in so I just cut it off). shorten FRONT, BACK, and SIDE 3″ at the hem to bring the jacket to the high hip, which is my best jacket length. shorten BACK 2″ evenly across the at the upper HBL to correct the balance, continuing the alteration into the SLEEVE, tapering to nothing at the hem (in patternwork, this was actually done as 1⅜” alteration at the back and ⅝” alteration at the front, both tapering to nothing at the hem – the split is because I ended up moving the shoulder seam forward). shorten SLEEVE 1½” at the hem to bring it to my preferred wrist length. take in FRONT, BACK, and SIDE ¼” at the waist, tapering to nothing at bust and lower HBL. This takes out 2″ total from the waist circumference. move up bust dart ¾”. move shoulder seam ⅝” forward, move notch on the sleeve accordingly. 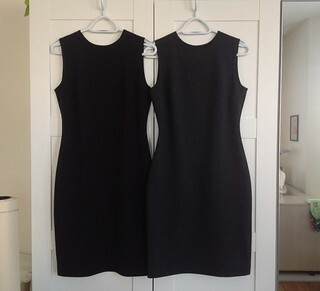 raise neckline 2″ at CB, lower neckline ⅝” at CF, redraw pleasing curve (the jewel neckline out of the envelope is more of a closely-fitting slightly curve V-neck, and much too deep in the back so I knew this would need attention). At this point, I got as far as I could with the muslin and it was time to cut regular fabric. I could have made another muslin but I wanted to wear this to work to see if it would be comfortable all day. I knew there would likely be other alterations but I figured they’d be minor. 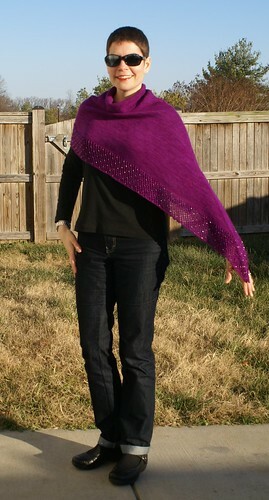 I used a long-time resident of the fabric stash – a dark fuchsia wool/poly crepe with a lovely drape. No lining as I wanted this to be quick. This wearable prototype was quite comfortable, but showed that the CF needed another ½” of length. I compared the original AB and CD fronts and didn’t like the discrepancies so I figured I’d adjust the pattern piece I already knew – so I added a ½” of length to it and darted it out in a second dart. The bust dart of the AB front is meant to point at the bust apex, in the two-dart CD front the darts are just below and just above the bust line. I angled both of mine a ¼” toward the bust line. Then I made another muslin because I thought I could narrow the waist a little bit more and I didn’t want to guess. 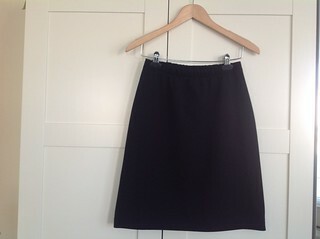 I took in the FRONT, BACK, and SIDE ¼” at the waist and hem, tapering to nothing at bust HBL. 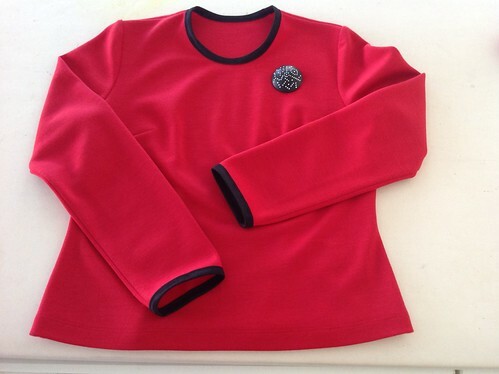 This reduced the waist circumference another 2″ for a really lovely and comfortable fit. When I was sewing this second muslin, I decided to take out the bit of ease in the sleeve. On walking out the sleeve cap/armhole seam, there was ½” of ease. I took that out ¼” at each notch, taking the alteration all the way down to the hem for a very slightly narrower sleeve. I have not had time to take pictures of the muslins or the wearable prototype so those might come later. For now, I wanted a record of the changes I made, in case I lose the piece of paper where I wrote them all as I went. I wasn’t going to participate in SWAP (Sewing with a Plan) this season. 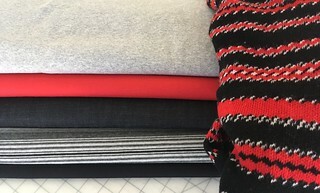 Between too much going on, sewing mojo on vacation, and inspiration pictures pulling me in too many different directions at once, I didn’t feel like planning a wardrobe to fit arbitrary rules that may not fit my lifestyle. You’re making a collection of 11 garments to be worn as outfits of at least two pieces that work for your personal style. It’s not quite finished – it’s missing a piece. Something in light gray. I’m not sure if this will be a dress or another top. We’ll see. 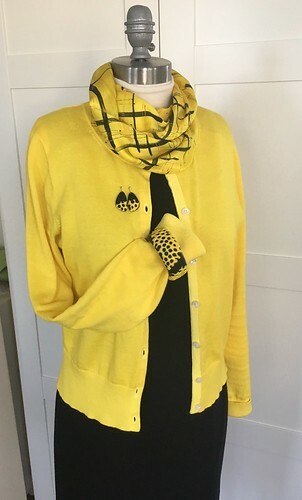 Here’s something that caught my eye now as I was looking at the rules: “Multiple styles of pants, tops, jacket/cardigan, dresses, accessories, etc are made from the limited color/print palette. New seasons bring new items that work with some of the garments from prior seasons. 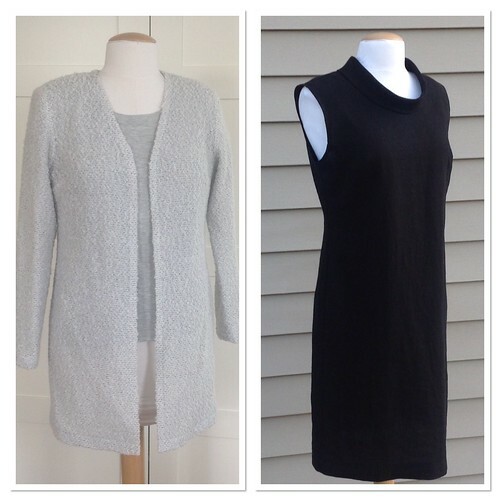 Your goal is to create a collection that looks like it belongs together and that you can easily add new pieces to in the future.” When I sewed a SWAP wardrobe in early 2016, I used just three patterns and a bunch of different fabrics. I think the idea here is the opposite – choose just a few fabrics and go to town on patterns. Hmm, something to chew on. I may rethink the whole thing yet. And that’s all I have today. See you soon! I hope you are all off to a good start in this new year, sewing up the stash and thinking up cool new things to make. Here we are just two weeks into January and I’m in a completely different space creatively than back in December. I had been thinking about sewing a wardrobe of separates, as part of the annual SWAP contest on Stitcher’s Guild. But this month, I started a new job that comes with a uniform requirement – a dark gray jacket. Scrub jacket, to be clear, so it’s not like I can just sew up some of my beautiful gray wools and call it good. I’ve decided that if I have to wear a dark neutral cut-as-unisex jacket, everything else should be bright colored and feminine. So I’ll be wearing, and making, bright colored dresses with a matching scarf and bracelet. 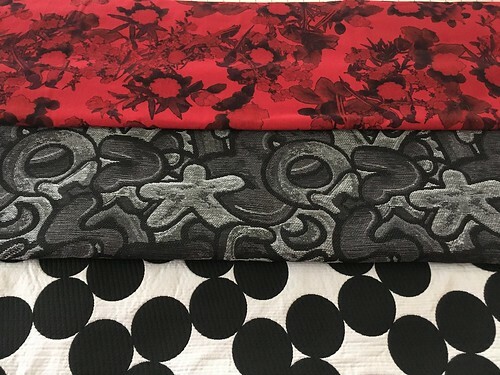 I’ll be working with the colors above with the aim of creating a capsule of two dresses (one long-sleeved and one sleeveless), one or two scarves, and a couple of bracelets, in each color family. 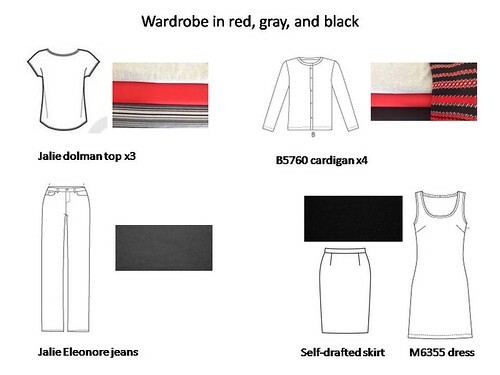 Because the jacket is fairly dark, the dress colors will mostly be on the lighter end of the spectrum for contrast. 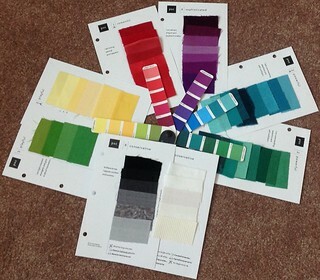 This should also be a good time to experiment with various trim ideas and color-blocking. The sewing plan then is to work with a couple of TNT dress patterns all year and refine my preferences in terms of fabrics, trims, and style details. 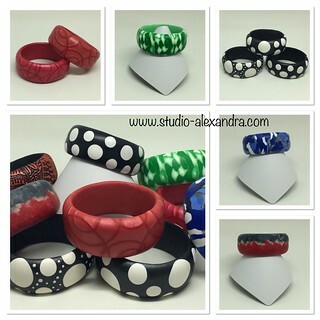 On the polymer front, I’m planning to make bracelets to go with the dresses, and because I want to perfect the process, I’m going to make a new bracelet every two weeks. I’ll be back soon with a finished knitting project. See you then!